 Don’t sauce pasta like this. It may look neat, but it doesn’t cover all the pasta, and eating it can be a mess (photo courtesy International Pasta Association). 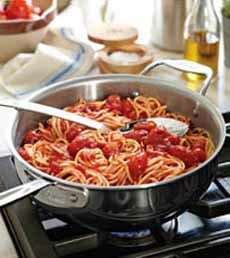 The correct way: Toss the pasta and sauce in a pot or bowl to fully cover each strand (photo courtesy All-Clad). Authentic saucing (photo courtesy Davio’s Boston. Every great pasta experience requires a great sauce. It’s not just the flavor of the sauce that matters, but when and how the sauce and pasta get come together. Correctly saucing your pasta is the difference between cooking authentic Italian and following an incorrect culinary path. 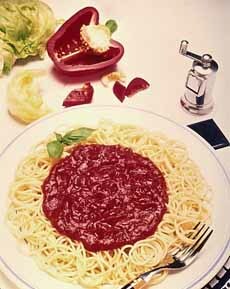 Americans have been trained to place a pool of sauce in the middle of a plate of pasta. No! No! Do not pour sauce on top of un-sauced pasta, as in the top photo. 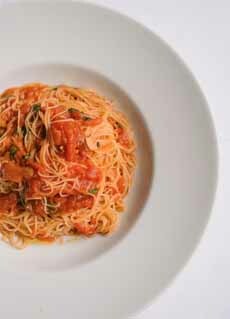 According to DeLallo, an importer of Italian foods, a dish of pasta served in this manner in Italy would be a disaster. Americans have been accustomed to serving pasta as a mound of undressed spaghetti or other noodles in a bowl or on a dish, topped with a ladleful sauce. We couldn’t track down how this practice originated, although it is definitely an American practice. It likely began in Italian-American restaurants, and our guess is that the first cook who topped pasta with sauce this way did it for aesthetic reasons. It does look prettier. But it isn’t as functional. In authentic Italian cuisine, the sauce is always incorporated into the pasta before serving. Every strand of pasta is thus coated with sauce, and the eater doesn’t have to work to coat his/her own—many of us creating drips and spatters in the process. Plus, the amount of sauce used is just enough to coat the pasta—not to create a sea of sauce. Authentic Italian pasta dishes do not swim in sauce. 1. Heat the sauce by the time you add the pasta to the boiling salted water. Keep the sauce on a low simmer until the pasta is ready. Your pasta shouldn’t wait for your sauce to cook; the sauce should be awaiting the pasta. 2: Moderation is everything. Use at most a quarter cup of thick sauce per person (such a tomato- or cream- based sauce), or two to three tablespoons of an oil-based sauce. The ratio is 1.5 cups sauce to 1 pound of cooked pasta, or 1 cup of oil-based sauce to 1 pound of cooked pasta. 3: Reserve some of the pasta water in another container when you drain the pasta (we use a cup). Never rinse the pasta: That will eliminate important starches that help the sauce stick. 4. Return the empty saucepan to the stove, over high heat. Add the drained hot pasta and the heated sauce, and toss to coat evenly (hot pasta will absorb more sauce and flavor). This quick toss in a hot pan allows the two components to meld and and create a beautiful flavor and texture. The starches from the pasta will slightly thicken the sauce. Tip: We’re a bit messy, so rather than clean sauce spatter from the stove, we first toss the pasta and sauce in a large bowl; then add it to the pan. 5: Add a couple tablespoons of the reserved hot pasta water to the pan, to smooth out the sauce. Reserved pasta water contains starch that can be used to thicken the consistency of the sauce, so add another couple of spoons if you like. Total time of the pasta and sauce together on the stove is about 2 minutes. 6: Transfer the pasta to a warm serving bowl or individual plates. Pasta terms and shapes: a glossary of explanations with photos. Ingredient substitutes: What to do when you don’t have sauce or parmesan. Leftover pasta for breakfast: You’ll love it! Make stir-fried pasta with leftover pasta. Turn leftover pasta into an antipasto. More recipes for leftover pasta, from green salad to cole slaw. How to sneak veggies into pasta: Your family won’t complain! Breadcrumbs on pasta: a Southern Italian tradition. Dessert pasta: from berry lasagna to chocolate pasta. Toast uncooked pasta for a toasty, nutty flavor. The history of pasta: It began in China.